(Newser) – It's not the first time a fast-food joint has come under fire for hot-beverage injuries, but this time it's not just the coffee's fault. 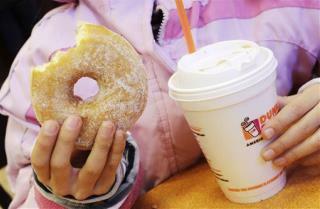 A New Jersey woman has settled her lawsuit against Dunkin' Donuts for $522,000 after she tripped over an exposed spike from an out-of-place curb stop in one of the chain's parking lots, reports MyCentralJersey.com. Per the lawsuit, Maria Marsala says she had just purchased several coffees from the Highland Park store one morning in January 2012 and was walking to her car when she fell over the spike, spilling hot coffee all over her face and neck. She should've been "watching her step", where she was going, then she probably wouldn't've tripped, hopefully! HEY! Fuhgeddaboudit!!! It's NEW JOISEY.!! There ya go ALL! !